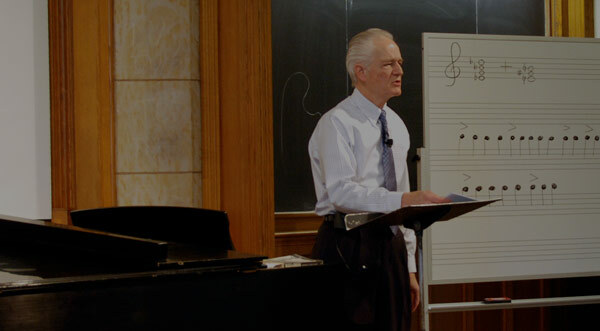 The history and development of the symphony is the topic of this lecture. Professor Wright leads the students from Mozart to Mahler, discussing the ways in which the genre of symphonic music changed throughout the nineteenth century, as well as the ways in which the make-up of the symphony orchestra itself evolved during this period. The changes in the nature of orchestral music are contextualized within the broader historical changes taking place in Europe in the nineteenth century. The lecture is supplemented with musical excerpts drawn from Mozart, Tchaikovsky, Dvorak, Wagner, and Mahler. Professor Craig Wright: Okay. Good morning. You are the last people left standing. Right? I can tell you at the beginning of this semester which of these lectures will have the lowest attendance rate. And it’s this one. And I’ll tell you where it’s going to peak again — as we get closer to the final exam. But you are the good folks. You’re here. You’re sticking with it, so good for you. If you can make it to section tonight and tomorrow, that’s great too. What are we doing today? Well, last time we left off talking about opera in the nineteenth century. And the session before that, we were talking about the development of the piano in the nineteenth century. Today, what do we want to do? We’re going to talk about the development of the symphony, specifically the symphony orchestra, in the course of the nineteenth century — and it did undergo significant changes, as we will see. What symphonies have we visited here in our course? Who can give me the name of a symphony that we’ve studied? Roger. Professor Craig Wright: Beethoven’s Fifth Symphony. We did a lot with that at the very beginning of the class. Any other symphony? Elizabeth. Professor Craig Wright: Beethoven’s Sixth, which was the basis of the Saybrook concert. Any other symphonies? Angela. Professor Craig Wright: Beethoven’s Ninth. Yes, we talked about that in an early lecture. [sings] So we’ve done a lot of Beethoven. We haven’t — and Thaddeus. Professor Craig Wright: Mozart. Okay. Mozart’s G Minor Symphony. So we’ve done Mozart, Haydn, and Beethoven for the most part, but there’s a lot of symphonic composition after these individuals, extends into the early twentieth century and that’s what we’re going to track today. So today’s lecture will generally be about the symphony from one M to the other M. You hear about the three B’s in music. Well, these are the two M’s, from Mozart to Gustav Mahler. Let’s start with Mozart. Let’s play just a little bit of his “Eine kleine Nachtmusik,” “A Little Night Music.” It’s a sort of divertimento, evening music for entertainment. Let’s listen to a little bit about it and then I’ll say something. [music playing] What can we say about that music? Well, we’ve talked a lot about this before. It’s very patterned. It’s very symmetrical. It’s balanced. We have antecedent and consequent phrases and they come in the music with the classical period. What about the orchestra? Well, it’s rather small in that it’s dominated principally by the strings. And we had a couple of Listening Exercises where we’d see the strings play the themes and then the woodwinds maybe come back to echo them or to answer them. But most of the musical material is getting presented by the strings. The texture — well, the texture is rather thin here because it’s not a very big orchestra, a thin texture. And what can we say also about the texture? Well, it tends to be rather polyphonic, homophonic or monophonic? Well, in that case, homophonic. Basically, you got a melody plus accompaniment. And we could also say — something that we’ve talked about — that this music has a kind of rhetorical strategy to it. We have this idea of music. It sounds like a melody, it sounds like a theme, or music that sounds like it’s coming between themes, of leading us somewhere, transitional music, music that may be a contrasting theme, music that ends a section. So it’s music that does something, music that’s trying to get us from point A to point B and point C and so on, so it’s a sort of rhetorical music, teleological music if you will. Okay. Now, let’s turn to a piece of romantic music. And before we do that I’m going to say a thing or two about this romantic music. It’s a piece by Tchaikovsky from his Romeo and Juliet, and I think we have the titles of the pieces that we’ll be listening to on the board up there today — so from his Romeo and Juliet. And you’ve probably heard this music before because it used to be — a lot of it used to be used in cartoon music. Anytime there was a love scene this particular music would come on. So what are its qualities here? Well, first of all, it has a long, sweeping melody here in romantic music, a long, sweeping melody that is rather asymmetrical in shape. Instead of having neat units of two plus two plus two, it could go on over bars or maybe it’ll be a seven-bar phrase, something like that. So the melodies tend to be long; they tend to be asymmetrical. Rhythm — think about rhythm in the music that we’ve been listening to. My paradigm here is the beginning of the Brandenburg Fifth Concerto Grosso, in which the rhythm starts out [sings]. It’s very regular. It’s like a machine gun, almost, or a sewing machine, or some kind of repetitive process there. When we get into the classical period, rhythm is somewhat more relaxed but it is still a pattern, [sings] but here, with this music in the romantic period, the themes are not only long and asymmetrical; the rhythms don’t seem to shake out in patterns that allow us to tap our feet or allow us to conduct it easily. So we have ties over bars. We have lots of syncopation. We have irregular phrasing, somewhat irregular metrical patterns as well. Tempo — we’ve talked a little bit about this before and this idea of tempo rubato here. In romantic music, we get wild swings of tempo in that it can be coming along at a regular pace and then slow way, way down and then speed up to get back on track and slow down and so on. And this is part and parcel of the romantic aesthetic in the sense that it tends to swing wildly from one extreme to another, wildly in terms of rhythm and wildly in terms of dynamics. We can go from very, very quiet to very, very loud in a way that Mozart couldn’t. Remember we were talking about Mozart’s piano, which weighed about one tenth of what this piano weighs up here. This piano probably weighs about eight hundred pounds. Mozart’s probably weighed about one hundred pounds. So this is a much bigger instrument. You can play very quietly on it or you can make a huge sound on it; same thing with the orchestra and we’ll come back to that point today. Mozart had a modest orchestra. Mahler at the end of this period had a huge orchestra. So this allows for these wild swings. The romantic period is sort of a bipolar period, I guess, in terms of music in that regard. So it’s a really remarkable passage. It’s made possible by this newly enlarged orchestra so let’s talk about this orchestra for a moment, and we’re going to reference here our four “food types” or our four instrumental groups for the — for classical art music, starting with the strings. We don’t really have any new instruments here in the romantic period. We still have basically the four string instruments of violin, viola, cello and double bass, but they are different. They’re different from the instrument that Mozart was playing. What happened? Well, in the nineteenth century the construction of the violin was changed rather significantly, and I think I could just hold my hand out here, maybe demonstrate this kind of thing. First of all, there was a higher bridge put on it. If you have the bridge holding up the strings in an eighteenth-century violin it might be like that — a nineteenth-century violin like that, higher bridge. That allows you to have more tension. It puts more tension on the entire instrument and at the same time, the strings that had been used, which were made of — anybody have a sense of what violin strings in the eighteenth century were made of? Chelsea. Professor Craig Wright: Catgut sometimes, yes. Yes, animal lovers, catgut. More normally sheep gut. Okay? So sheep gut, and that wouldn’t — the tension that could be put on that was not as great as if you were using a wire string. So in the nineteenth century, technological advances, wire strings, more tension, higher bridge, and to — well, also the fingerboard was extended. It’s longer so oftentimes with a Stradivarius they’d chop off the fingerboard and put another — a new fingerboard on it and put it all back together again. What else? I know I’m missing one other important thing. Well, maybe that will have to do it for the moment, and what we’ll end up with — oh, I know. The bow. If you look at an eighteenth-century bow and go to our collection of historical musical instruments on Hillhouse Avenue, the amount of horsehair there is rather narrow. It’s almost double when you get to the nineteenth-century bow. So the bow is bigger. So the whole thing is more powerful, and I’ve asked Jacob just to bring in his viola, which is fundamentally a nineteenth-century viola in construction, and just rip through a couple of things, just to give you a sense of the volume of the instrument. Play anything. [plays viola] Okay. So that’s all I wanted him to do but just to give you a sense — that’s a big, rich sound. Play a couple of — can you play a couple of chords like maybe the ending of something with double- and triple-stops — with much volume? [plays viola] Okay. So big, powerful nineteenth-century violin as opposed to the smaller one that Mozart had. Let’s talk about the woodwinds. Here in this family, new instruments were introduced. First of all, we have the piccolo up at the top. We’ve heard the piccolo before. Remember in the storm scene of the “Pastoral Symphony,” number six, the Beethoven storm scene. If you wanted to get a sense of the whistling wind up there, that’s what he did. He had the piccolo play way, way up high. Then you could hear it. It just kind of gave that effect. At the other end there of the extreme we have the double — the contra — or double bassoon being added, the low bassoon playing down an octave lower than — is that correct, Lynda, playing down an octave or even lower than that? Lynda: Oh, maybe about that. It’s enormous. It’s lovely, lovely, lovely. It’s funny about music, what it can do for you. My mother’s family was actually from Iowa, a farm family from Iowa, and as a child they took me to Spillville, Iowa. “Get in the car; we’re going to get culture this afternoon. No more softball games. We’re going for culture.” So I went to Spillville, and I can’t hear that music without thinking of that particular family or those particular people in Iowa. It’s weird. It’s kind of — as we’ve said before, music provides an entry to the inner recesses of your memory sometimes. In any event, aside from that discursus, let us continue now with the brass family. We — what were the two instruments in the orchestra that we have encountered up to this point in terms of brass instruments? What have we heard in a symphony? Elizabeth. Student: The trumpet and the trombone. Professor Craig Wright: The trumpet and the trombone. Okay, fair enough, trumpet and trombone. There’s one other important one that actually was in the orchestra before the trombone. Chris. So that’s how Beethoven gets his kind of heroic effect. He’s doing three things there in the finale: One, switching from minor [plays piano] to [plays piano] major. He has — it’s a very triadic theme and he’s bringing in the heavy artillery, the newly invented heavy artillery — or at least newly introduced heavy artillery — the trombone there. And it gives it this powerful, if you will, in the vernacular, sort of “ballsy” effect with that brass. And this got extended to the low brass as well. The one family of the brasses that we’ve talked about that we haven’t really explained in terms of the history of the orchestra is the tuba here. When does the tuba get introduced? Well, it gets introduced right about this time, about eighteen twenty-five, eighteen thirty or so. The first composer to use the tuba in an orchestral piece was Hector Berlioz in the Symphonie Fantastique that we’re going to be embracing in sections this week. So we have the tuba coming in here, and actually it was, as you can see there, originally an instrument called the ophicleide. It was a French instrument and Berlioz heard this as a kind of giant keyed bugle in the military bands of the period. Think of the French Revolution. Think of the Napoleonic wars, all of these troops marching up and down with the brass bands along the Champs-Elysées. He hears this. He brings this military instrument in to the symphonic orchestra to add depth to the lower part of the brasses. Let’s go back to our Dvorak piece here, the Dvorak “New World Symphony,” second movement, and here we can hear the power and the depth of the newly enlarged brass section, [music playing] way down there, that low note played by the tuba and so on. So that’s something of the brass group as an ensemble. Let’s think of these instruments individually. If we look back at a symphony by Mozart, not only is the orchestra stronger, but how he is using these brass instruments is very different. We looked at the French horn before, and we’re now going to focus on the French horn. In the very beginning of our course, we had a professional French hornist in here, Eva Heater, and she played — does anybody remember anything of interest about the instrument that she played and how it differed from the modern French horn? What didn’t that instrument have that the modern French horn has? Roger. Professor Craig Wright: Keys. Okay. Keys or valves, yeah. That’s it exactly: keys or valves. That gets put on the instrument. Instead of sliding in these crooks and changing the length of the pipe that way, they figured a way of having valves and you could do it quickly and — with keys, but that’s a nineteenth-century invention. An eighteenth-century horn just over-blew and it could play some things such as [sings] very easily, repeated pitches, [sings]. Remember our horn concerto of Mozart or [sings]. It could over-blow up the harmonic frequencies, up the partials as we said before, with ease, but it couldn’t play chromatic kinds of things and as a result it’s kind of stuck there in the background kind of providing what I like to think of as a sonic glue for the orchestra, but it rarely plays any solos in the orchestral fabric outside of a concerto. Well, let’s see what happens to the French horn inside of the orchestra here in the nineteenth century, where it begins to come forth as a solo instrument because the melody it can play is so much more complex and much more interesting. So here’s a famous French horn lick out of Brahms’s First Symphony, [music playing] and back to the horns [music playing]. Listen to the depth. It’s a lovely passage but it’s featuring the brasses and particularly the solo French horn. I guess the thing also to notice here is how slow the music is going — slowly the music is going. It’s all slowed down, kind of going at a crawl here. And that’s an interesting point about the whole nineteenth-century notion of time and what they thought about time and the passage of time — the early nineteenth century, the beginning of the discovery of the whole discipline of paleontology and how old the earth was and how many years civilization had existed and so on. And it is all getting extended. Instead of biblically, five to seven thousand years, now it’s twenty-five million years, which of course has been greatly extended since then, but everything here is being allowed to slow down. And by way of reference, let’s go back to our Mozart here and think about how he constructed it. [plays piano] Well, there we have, again, the beginning of “Eine kleine Nachtmusik” and he has a chordal pattern, triadic, going up. That pattern lasts about four seconds, if you [sings] two, three, four, come down, one, two, three, four — four seconds on each chord. He’s moving through his material rather quickly and we’ll say why in a moment. Now, by way of contrast, let’s go to music, oh, sixty or so later — years — or so later in the middle of the nineteenth century and focus on an overture by Wagner here, overture to The Flying Dutchman, and we’re going to listen to just the end of this and sort of think about how long Wagner can sit on each chord. Mozart thought he could sit on each chord here for about four seconds. How long does Wagner sit on a chord? [music playing] All one chord, [music playing] change, another chord, [music playing] all one chord, [music playing] just triadic notes of that one chord, changes that to minor, just drops the third down, same chord, [music playing] and now back to the original chord, holding that one chord [music playing]. Where are we on the counter there? Professor Craig Wright: Nine fifty-two, so we had fifty-two seconds of music there and we went through three chords so we’re averaging about eighteen seconds per chord, something like that, four or five times more than Mozart was doing. How can Wagner do that? What’s the difference? Why did Mozart have to move through his chords faster? What’s happening in this music? Supposing you tried to play that Wagner music with Mozart’s orchestra. It wouldn’t work. Mozart had this dinky, little orchestra. How many people were in Mozart’s orchestra? Well, depends on where he was at a given time. Haydn’s first orchestra had sixteen people in it. Mozart, when he gave a concert in Vienna usually wanted about thirty to thirty-three. We get to Beethoven, we’re up to fifty to sixty in a typical Beethovenian orchestra in Vienna eighteen ten or so. As we move in to the later part of the century, these orchestras keep adding more and more instruments, more and more players. You got to — well, if we get — have all this brass we got to balance them with more string players so we’re getting up to eighty, ninety, one hundred by the end of the nineteenth century so this is an important point. Mozart had a very small orchestra and as a result — or maybe he could get away with what he had because he had great musical ideas. Right. He had to have great musical ideas because the sound itself wasn’t going to rescue him. With Wagner and these later composers, they may not always have to have the greatest of musical ideas. The triad is not a particularly novel musical idea, but he can get away with just taking [plays piano] — he can get away with doing that and it sounds great. Everybody — didn’t you like that Wagner? Didn’t that sound terrific? And it’s just because he’s got this huge orchestra. Sound, per se, is replacing musical idea. Mozart, terrific ideas; Wagner, terrific orchestra, and he knew how to use it. So a bigger orchestra allows longer movements. I have said before I think that it’s axiomatic in music that the more people you have on a stage or involved in a performance, the longer that performance is going to take. And with regard to the symphony, how long does a movement within a Mozart symphony take? If you were to look at the CDs up here of a Mozart symphony, what would you guess? First movement of Mozart’s G Minor Symphony: how long does that go? Hm? Professor Craig Wright: Yeah. Who said that? I can’t — okay. Oscar says seven minutes, yeah, and actually that’s about right for the G Minor Symphony. It’s one of the shorter ones of Mozart but let’s say five to ten minutes, ten minutes outside. If we get to Beethoven, how long will a movement of Beethoven take? Well, about twenty minutes sometimes with his bigger symphonies like three, five and nine. When we get to Mahler and Bruckner, the length of the movements can go on even more, and an entire symphony of Mahler might go on for an hour and a half, so these are bigger. The big orchestra has led to longer symphonies and the sound obviously is very luxuriant, very opulent. The sound in music probably never gets any more opulent than it does here at the end of the nineteenth century. Two other aspects involved here having to do with the physical world and, in a way, technology. Of course, the nineteenth century is the period of the Industrial Revolution, and some of these innovations, in terms of metallurgy and design, got applied to musical instruments. For example, how many have ever played the flute in here? Okay, a number of people — both male and female — and if you look — remember the video we saw of a Baroque flute it actually had a very rudimentary key pad on it, and you look at a modern flute and it’s got this keyed system with all these things up there, all of the different keys and extenders, and that’s all an invention of the nineteenth century. They completely reconfigured the flute and how you play it in the nineteenth century. And we’ve talked about all these other instruments that got added. So a kind of technological revolution was applied to musical instruments too, but the most interesting thing is, when you got all these instruments together, how much sound they could make. Let’s say you were in the — you lived in the nineteenth century and you wanted to hear the biggest sound that could be made. What do you think you would do? Where would you hear the loudest sound? Jennifer. Professor Craig Wright: An organ. Okay. That’s good. That’s pretty good, though it wouldn’t have sounded as loud then as it does now because now we’re using something else I’ll get to, but that’s a good start. Okay? Anything else? It doesn’t have to be musical. What would give the biggest sound? Sarah. Professor Craig Wright: I beg your pardon. Acoustics in music halls. Yeah, we’re going to come to that, but just in the real world. You’re in the city of London. What’s going to annoy you the most, make the biggest sound? Roger. Professor Craig Wright: A big — possibly a bell. Yeah, but that’s back — we’ve had those since the Middle Ages. I was thinking of two things: cannons, okay, huge fire power there, huge, loud sound, deafening roar; and one other thing that came in in the nineteenth century: steam engines and all the things that it could produce — trains, steam whistles, this kind of thing. But the third thing really is this orchestra when all of these new instruments are coming together in such large numbers. And once you have them all together you got to have a place to put them so they started building new concert halls and concert halls are particularly good acoustically. The model for this, and I don’t know if I put this — yes, we did. Okay. It’s up there on the board. It’s in Vienna. It’s called the Musikverein and it’s a famous hall and it’s a remarkable hall, maybe the most perfect musical hall ever built. That was the prototype, and then other concert hall builders around the world began to adopt it. We adopted it here in the United States. Can anybody think of a concert hall in the United States that is particularly famous and acoustically beautiful outside of Carnegie Hall that I’ll talk about in a moment? What other one? There’s one other one, early concert hall in the United States. Symphony Hall in Boston. If you’re ever in Boston — anybody from Massachusetts here? Anybody been to Symphony Hall? Okay. Go in there. It’s a knockoff of the Musikverein so if you want to see what Vienna looks like go to Symphony Hall in Boston. There is another one that is very close to us here that’s pretty close to the — this design and where is that? Built about the same time. Our own Woolsey Hall, a big hall seating about twenty-five hundred people. If you’re ever in Woolsey, notice the fundamentally rectangular design on it. Go in and look at the floor. It has a suspended floor there. And it has a suspended floor for a particular reason. That floor serves as a resonator and there are other resonators around that we needn’t go into, but next time you’re in Woolsey go in and bounce because that’s in — on that floor. It’s designed to have the sound resonate more. Now, what’s the problem with Woolsey? Why don’t string quartets like playing in Woolsey? Hm? Professor Craig Wright: It’s too booming. Okay. It’s too resonant. But what was the model? What the model is — you get — Roger. Professor Craig Wright: Well, it was partly built for the organ. Yes, it was built for the organ but Woolsey Hall can sound absolutely marvelous for a symphony orchestra — not booming and not overly resonant, if what happens? Robert. Now let’s take a look at what I call the main line here of symphonic composers — and it’s mostly a German tradition, right, a German symphonic tradition. But that became the model for the United States, and that’s why they brought Dvorak here; Tchaikovsky came to the United States and was involved in the opening of Carnegie Hall in New York City in eighteen ninety-three — as you can see, running from Mozart down to Gustav Mahler. Not all of them were German. Who up there is not German? Roger. Professor Craig Wright: Tchaikovsky was from where? Professor Craig Wright: Russia. Who else is not German? Oscar. Professor Craig Wright: I beg your pardon. Professor Craig Wright: Berlioz? Yes. Oh, I’m sorry. Of course, Berlioz. He is, of course, French and we’ll talk about him in section tonight. Anybody else? Well, Dvorak. He’s Czech. Okay. So — but they are all in this fundamentally German-educated tradition extending really from Bach in — but he didn’t write symphonies — into Mozart, Haydn, Beethoven down to Mahler. So we’re going to go to the end of the line now and talk a little bit about Gustav Mahler. Any of you listened to — ever heard a symphony of Mahler? If you’ve heard any music of Mahler, raise your hand. Okay. I would say about a third of our class has. Let’s talk about that just for a moment. I would say that if you haven’t been introduced to Mahler, don’t miss this one. It’s really great stuff and I hope to be able to convince you of that here today if you’re kind enough to come along with us here in this trip along the road of high art music — and we don’t want to miss the pinnacle, in a way, of high art music. For me these two M’s are very important, Mozart and Mahler. They write some really astonishing music, in different kinds of ways. So Gustav Mahler — who was he? Well, he was a Jew born in Moravia, which is a section of Czechoslovakia, got his musical education in Vienna, was a pianist and principally a conductor. He earned his living conducting. And he went all around the world conducting, and we’ll talk more about that next time — where he conducted. And he composed mostly in the summertime. He would go out to the Alps in one of these mountain retreats in — where he could have solitude and he would compose. And in the course of time, he wrote principally nine symphonies and something we’re going to talk about next time, which is the orchestral song. But we’re focusing on just one symphony today — indeed his first symphony, 1888. It starts in an unusual way with a kind of homage to Beethoven because the beginning of this — Mahler’s first symphony — sounds like the beginning of Beethoven’s Ninth Symphony, but let’s just listen to a bit of it. Oftentimes with Mahler people talk about the “cosmic” quality of Mahler’s music. Well, what does that mean? What kind of sound is cosmic? Well, maybe it’s kind of open. Maybe it’s kind of hollow. Maybe it seems to be endlessly spacey in that way, so here’s a good example of Mahler’s style, particularly his cosmic style. [music playing] And those trumpets are sort of off-stage trumpets, perhaps giving you more a sense of far-out distance. So that’s the beginning of the first movement, and I’ve put this diagram up here because it’s interesting that so much of the material that he is working with derives from a particular complex, a particular cell of material. Mahler is a developer and that’s, generally speaking, what this German main line tradition is into — not always. Tchaikovsky’s not a developer. He has trouble when it comes to developing themes, but Beethoven — Mozart’s a developer, Beethoven is a developer, Brahms is a developer, Mahler is a developer, and what they develop is, as I say, a nexus of musical material. And now we’re going to go on to a very strange movement, the third movement, the slow movement. Remember in symphonies we usually have fast, slow, scherzo, fast, finale. Well, in the late eighteenth, early nineteenth century, sometimes they’d switch those. They’d put the scherzo number two and then the scherzo minuet number two and then the slow movement number three, so here we got the slow movement as number three. Let’s listen to a bit of it. See if you can recognize the melody that Mahler’s working with here. [music playing] I saw a smile come over Jacob’s face out there. Jacob. So that’s the first theme material there and you have the — using the same kind of X-ing process that we began our course with, we can make use of it here to kind of track or remember these particular themes. Myself, I can’t always hear them but if I can visualize them it helps me. All right. So we’re going to now go on to the second theme area. He’s essentially following our sonata-allegro form here and we have a long passage. It goes on for about three minutes, but it’s a quintessential moment of romantic music. It’s along the same lines of the Tchaikovsky that we heard before. So let’s just start out here and we’ll listen and we’ll comment on what’s romantic about the music that we’re hearing. [music playing] End of transition. Here comes the theme. [music playing] What’s romantic about that? Thoughts. Elizabeth. Student: There’s a lot of slurred notes. Professor Craig Wright: Okay. A lot of [sings]. Yeah, it’s a lot of slurred notes. Whether that kind of inspires this to romance I’m not really sure, but it’s not precise; it’s not marching along; it’s not discrete frequencies. Now what instrument is carrying the melody here, is particularly good at that kind of — what’s the German word in Vienna? Schlagober, or something like that for whipped cream kind of sound, probably some German — [music playing] Elizabeth, what instrument is playing that? I think we really have only about two minutes left and I do want to if — everybody was good enough to show up on time so I want to let you leave on time. Let’s go — just to give you a sense of the sound here, let’s go to the very end of this. It’s a long movement. It’s about twenty minutes long. We got about two minutes — two, three minutes to go, and you’re going to hear this extreme orchestral contrast here as it gets bigger and bigger. Notice that we had a minor theme here. The same theme comes back but he takes out all of the chromatic minor sound and makes it all major. [music playing] We’re going to get lots of heroic trumpets going on with that addition to our theme. Think about this. This I like to think of as the last gasp of the traditional high art classical orchestra. It never got any better than this. It never got any bigger than this for reasons that we’ll maybe comment on after it. So let’s listen and then one comment at the end. [music playing] And one final thought. Why did it stop here? Why did — what happened in the history of art music to change everything? Anybody have any idea? Daniel. Professor Craig Wright: Exactly. That’s what happened: electronically produced sound where you could control the decibel level and reproduce it. People started staying home and playing recordings and they could manipulate the volume any way they wanted at that particular point. Okay. Thanks for staying on. Have a great break. We may — I hope to see you in sections tonight and Friday and Monday when you get back.